Problem traced to R509 (100k 1/2W resistor) in the BASH power supply board. In both subs, this resistor had gone open circuit. Replacing restored normal operation. Replaced with 1W instead of 1/2W resistors. I suspect they are underated. I have been looking for an answer to this problem for a while now; both of my subs have not been working for years. The Infinity repair shops want an arm and a leg to fix, just about what I paid for them. There are not many forums discussing this particular problem. Could you elaborate a little bit more on this fix? I am a fairly technical person and do not mind trying it myself. Any assistance would be appreciated. R509 can be seen in the power supply schematic in grid C6, page 36. Track that down on the power supply board and measure with a meter. I found it to be open circuit on both speakers (quite a coincedence). Thanks to Trevor Pearman for helping me identify this problem and suggesting a fix. I had the exact same problem, and in the service manual he references, the suggested diagnosis passed (MOSFETS and other resistors). But, in checking the R509 on the power PCB, it was an open circuit as well. Just replaced this afternoon, and is now working! Thank you Trevor and thank you Internet! Anyone know where you can purchase the R509 replacement resistor? Digikey, Mouser. Radio Shack may have to order. I replaced the suspect resistor with a 100K 1W and voila! the subwoofer came back to life! 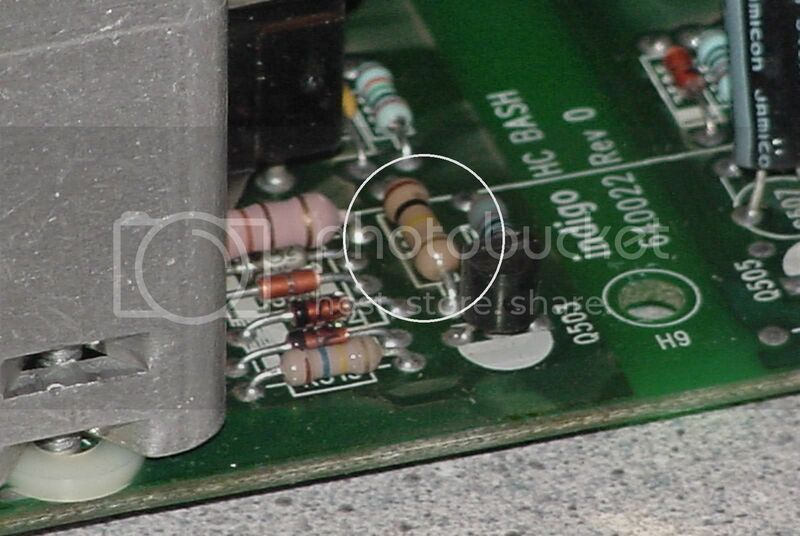 The part designator R509 is under the bloody resistor so you can't confirm it until you take it off the circuit board. I hope my pics will help those in the future that need to do this repair. 1 - The "bass volume" control on the front face that normally glows red (when not in use) and green (when in use) fails to glow aeither color. 2 - The subwoofer fails to work. Always check the fuse on the back panel of the speaker before you go any further. If the fuse is good, then it's probably this resistor. I had the same problem so I contacted a local speaker repair shop. To say that they were less than encouraging would be an understatement. I was not enthusiastic about having to put in a total of 4 hours of drive time (for two round trips), lugging around one of these 75 pound speakers, with little hope that the problem was even going to be solved. Your help was invaluable. The pictures form inthehunt2 were great, especially since that link for the schematics doesn't work anymore. Also thanks to inthehunt2 for suggesting to go to a 1 W resistor. I checked the resistor in my speaker and it was open circuit. I picked up a couple from a local electronics supply store and replaced it. Now the subwoofer works again. 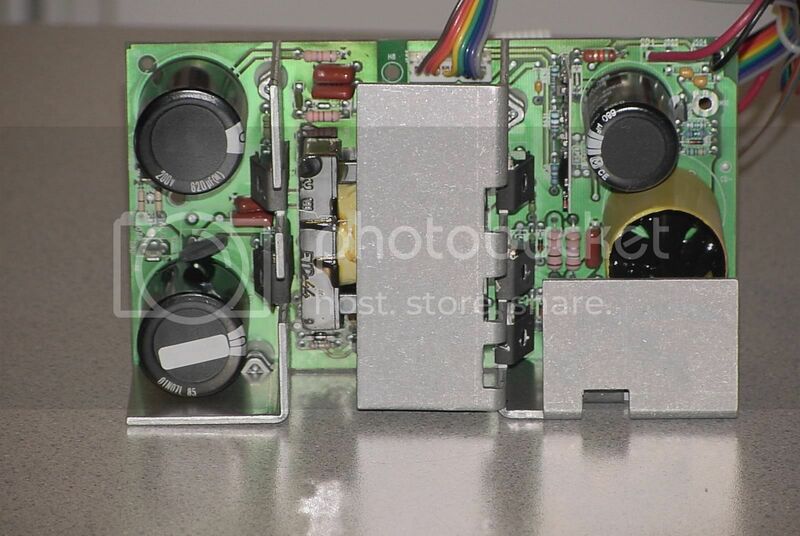 Does anyone know if the schematics for the speaker circuitry are still available online someplace?